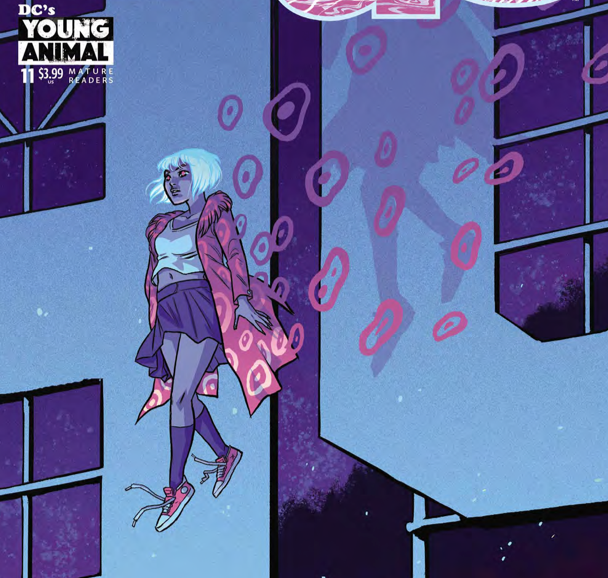 Shade, the Changing Girl #11 Review – AiPT! Loma Shade is wandering the Earth hoping to experience emotion and live like a poem. 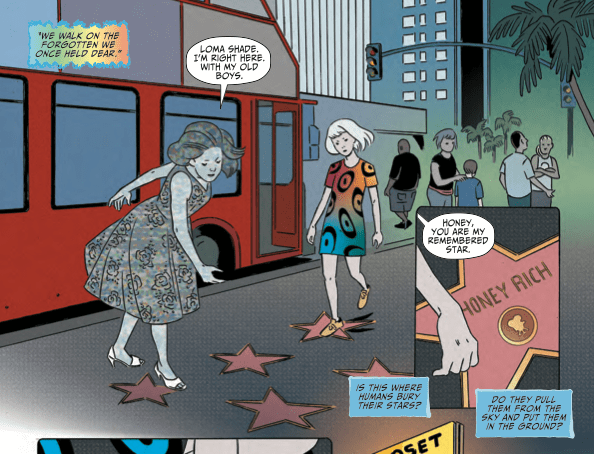 Her next adventure brings her to the glitz and glam that is Hollywood. She is desperately seeking Honey, a black and white television character that is all too real for Loma Shade. Loma believes that Honey is still the same young woman she saw on TV. She still has not grasped the concept of time and that ‘Life with Honey’ aired a very long time ago. Very often, Shade believes she is doing the right thing but she is naïve. Loma Shade does not understand human behavior. She has no concept of the manner in which people shield themselves with a façade of false emotion. While trying to save Honey she ends up hurting or at the very least angering her instead. In this issue we see more of Shade’s innocence. She was fearless when she grabbed the coat and embraced the madness but she has become more fragile the longer she is on Earth. We witness her struggles with the meaning of human emotions, lingo and especially sexuality. Just when you thought you had a handle on Shade, Megan and what lies next – wham! This issue fires two curve balls at you. Loma takes a new body for a ride and finds out something really heavy about her old one. Why is the Megan body suddenly feeling morning sickness? Did Shade get pregnant on Earth? Was Shade pregnant when she transferred to Megan’s body? Was Megan pregnant in the coma and no one knew? Shade would not have recognized morning sickness. Did Shades body chemistry change when she entered Megan? If so, did an alien avian egg transform into a human embryo? Either way Shade is about to learn a new lesson; what it’s like to fight for the rights to control your own body. This issue definitely has you thinking. Meanwhile, back on Meta, Loma’s avian body is dying. Lepuck is still trying to make everyone believe he does not care for Loma Shade and Mellu is still hell bent on vengeance. I really feel for Lepuck. This poor space panda is clearly in love with Loma. He is distraught over her leaving and is doing everything in his power to protect her. Mellu, well she is not as tough as we would all believe. Mellu is also driven by a lost love. Her search for Rac has overshadowed her moral compass and she will stop at nothing to find answers. Including weaponizing madness in the process. All in all a great issue! Did I like it? Castellucci explores the depth of human character through the eyes of an alien. Zarcone continues to delight with vivid colors and range of emotion. On the surface, this appears to be a light comic but if you take a chance and scratch it, you will uncover deeper emotions and a reflection of what it is to be human.